Before I start today, I want to thank all of you for the wonderful comments you left on my blog during the My Creative Time 12 Days of Christmas! I enjoyed reading each and every one of them. I have the best followers!!! 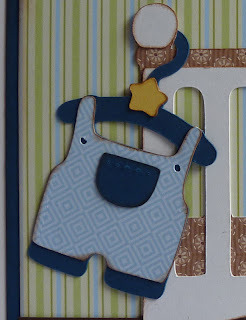 Today I am excited to share the baby card that I had published in the November issue of Cricut Magazine. This was my first publication, so it was a big thrill! And to make it even more fun, my friend Liz was published in it too! 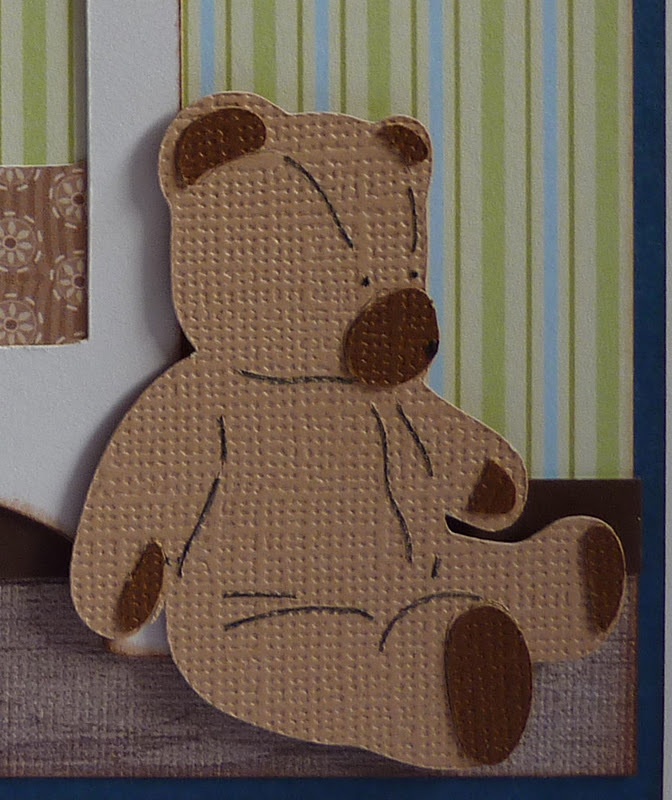 You'll have to visit her blog, Liz's Paper Loft, to get a peek at her gorgeous project. 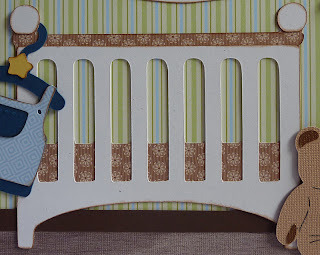 I used the crib from the Cricut Baby Steps cartridge, cut at 3 3/4". The adorable overalls, also from Baby Steps, were cut at 2 3/4". This little teddy bear is cut at 2 1/4" from the Christmas Solutions cartridge. I stamped this cute curvy sentiment from My Creative Time's All Star Baby stamp set on cardstock and then trimmed around it to make a banner. The star that it's tucked under is cut at 6 1/2" from Baby Steps and embossed with the Cuttlebug Swiss Dots embossing folder. Congrats on being posted! And it is well deserved! What a creative card! don't you feel like a star! this is so cute! I love all the different textures, it just adds so much! enjoy your day!!! That card is absolutely adorable! Congratulations on being included in the magazine...such an honor! Congratulations again Katie. I agree with Cindy very well Deserved. This card is just so Adorable. 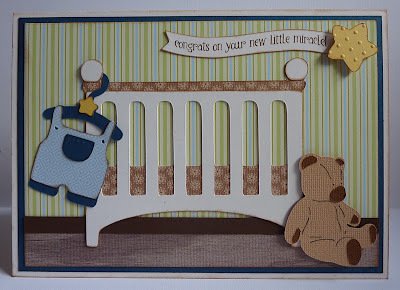 What a darling card Katie, the rug on the floor looks real, love the baby bumper in the crib and that teddy bear is adorable. Congratulations. OMGosh what a super sweet and beautiful card! Congratulations! Congratulations, what a great entry. Congrats! You deserve it. An amazing card. I remember when you posted it a while back. I made the cute little treat bags you made with the video. They were a hit. Your card is so adorable! Congrats on being published. That is so cool! I would like to be published too and should make it my goal this year. Thanks for the inspiration!--Pat N.
Congratulations Katie!!! Your creations are AMAZING!!! Your baby card is just precious-I absolutely love the crib, darling little bear and sweet sentiment! Very nice! I love your card, and congrats to getting published!! Love all your detail work! Congrats on being published, I saw this in the November issue and loved it. My submission was just accepted for the May issue so I know how exciting "the first time" is. I have a fairly new blog and just submitted my project on a whim and it was accepted, so exciting. I love all of your projects, thanks so much for the inspiration you provide! This is sooo adorable. No wonder they published it!! Congrats. So many details, the carpet actually looks like carpet! This card is just amazing. Congratulations and I hope this is just the first of many for you! What a beautiful card! Congrats!